STUNNING Moon Dust Necklace -Wear A Real Piece Of The Moon!-CLASSIC Test Tube Shape. 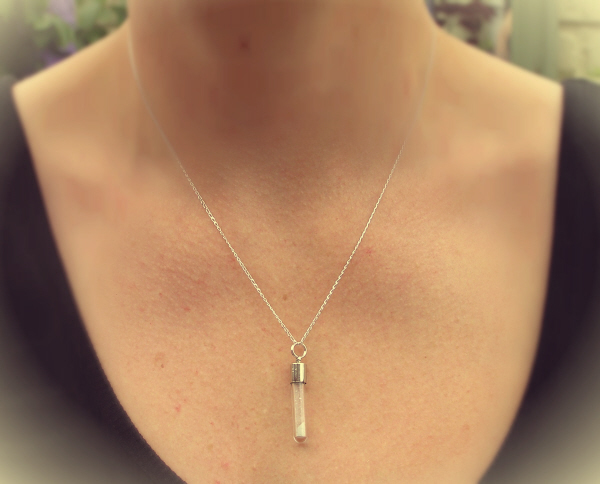 << Back STUNNING Moon Dust Necklace -Wear A Real Piece Of The Moon!-CLASSIC Test Tube Shape. This is a stunning and intriguing Lunar meteorite pendant. It is made with a sample of genuine Moon dust. It is made with a sample of genuine Lunar meteorite dust. I think we all feel close to the Moon as it is so often visible out of the window - but this doesn't compare to the chance to actually WEAR a piece of the Moon! The sample is dust collected while cutting a Lunar meteorite. This stone was found in Northern Africa in 2013 and weighs 156 grams. This is exclusive new meteorite material and not available in this form ANYWHERE else on Earth! This is a totally new piece of jewellery I have spent a lot of time planning. This is the very first one I have to offer.